BOXBERG, Germany — Robert Bosch, the world's largest auto supplier, wants to get even bigger. Like its automaker customers, Bosch must fend off new competitors such as Waymo and Apple and attract new customers in an era of autonomous vehicles, electric drive and shared mobility. The company laid out its strategy earlier this month at a press event here, showcasing two electric-drive technologies that it says could enable small manufacturers to speed vehicles to market. It also detailed partnerships that could give Bosch a boost in new products and services. Bosch's mobility technologies are already selling well — sales in its mobility division hit $50.1 billion in 2016, and the company expects sales to grow 7 percent this year. Automated driving and advanced driver assistance systems have contributed to the sector's success. In 2017, the supplier expects sales of its radar sensors to rise 60 percent and revenue from its video sensors to grow 80 percent. But Bosch's competition is getting stiffer as large tech companies and new startups join the sector. As electrified powertrains gain attention, traditional suppliers such as Delphi and BorgWarner have reorganized in anticipation of growing demand. Bosch is hedging its bets, relying on new customers and nontraditional partners in a new transportation future. 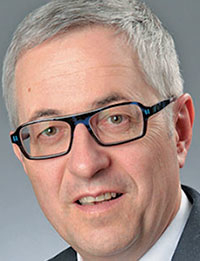 "We are evolving into a provider of services for road users," said Rolf Bulander, chairman of Bosch Mobility Solutions. "To come up with new concepts for mobility, we are also revising our conception of Bosch." To break from the traditional supplier concept, Bosch is looking to nontraditional customers. The supplier is no stranger to startups, providing sensors for Tesla's semiautonomous Autopilot system. But with two new powertrain products Bosch seeks to attract small manufacturers who want to build vehicles quickly. For low-range electric vehicles primarily intended for urban commutes, Bosch developed a 48-volt drive unit, a complete powertrain. One system provides about 50 km of range on a full charge, and systems can be combined to boost battery life or electrify internal combustion engines. It can be immediately installed into any vehicle body or chassis and begin to power it, Bosch says. Harald Kroeger, president of automotive electronics at Bosch, said the 48-volt unit can enable manufacturers to introduce a vehicle within a year, and double Bosch's annual internal growth. "This gives both established OEMs and new players in the market the opportunity to launch vehicles within a very short time frame of 12 to 18 months," Kroeger said. German startup e.GO Mobile, which is developing an affordable four-seat EV, built its prototype using the 48-volt drive unit, reaching up to 170 km in range. For longer-range EVs, Bosch is offering an electric axle drive unit, or eAxle, a scalable electric powertrain. The eAxle is also a complete system that can be adapted into a vehicle body, according to Bosch. "The eAxle is also something very easy to assemble, which has been attractive to West Coast startups in the U.S.," said Michael Budde, head of battery systems at Bosch. As automakers set deadlines for introducing electrified vehicles, Budde said it's vital to offer flexible electrification products. 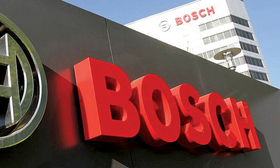 In addition to widening its customer base, Bosch is looking to new partners. Chinese tech giant Baidu recently said it was partnering with 50 companies, including Bosch, on self-driving technology. Bosch said it would contribute sensors to Baidu's open-source Apollo project, an initiative that could rival Silicon Valley efforts from Waymo, Uber and Apple. Bosch is also working with Daimler to introduce a self-driving taxi service by the beginning of the next decade." In March, Bosch said it was working with chipmaker Nvidia to develop a self-driving supercomputer. Since the announcement, Stephan Stass, senior vice president of chassis system control, said Bosch has increased its computing capability for artificial intelligence systems to about three times faster than the human brain.